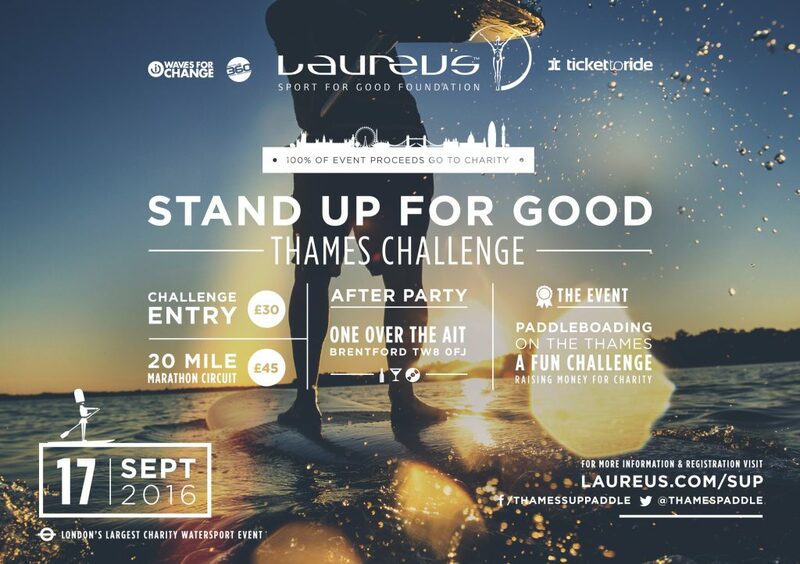 Take part in the ‘Stand Up for Good’ Thames Challenge on Saturday 17th September and help support youth sport projects across the world. This unique experience presents a fun challenge to those who are new to Stand Up Paddleboarding (SUP), and a brilliant marathon challenge for those with more experience. Either way it will be a day to remember and will give you a unique perspective of London! This is the fourth year of the event, created by Waves for Change and now supported by the Laureus Sport for Good Foundation. All profits are split equally between Waves for Change and the Laureus Sport for Good Foundation; both using sport to change young people’s lives for the long term. Starting and finishing at Kew Bridge, the Challenge course will take you up stream to Richmond and back on an eight mile paddle. This gives you a unique perspective of London from the river. Board and kit hire for the challenge, if required, will be £22. Challenge participants are encouraged to either donate £50 or set up a sponsorship page and try to raise over £100. Starting at 8am, the marathon will cover 20 miles from Shepperton to Kew Bridge. This is a real challenge for those with more SUP experience. Board and kit hire for the marathon if required will be £39. Participants will pass sites such as Hampton Court Palace and Kew Gardens, enjoying a unique perspective of London. Marathon participants are asked to raise over £350 for the challenge. The Stand Up for Good’ Thames Challenge after party will take place at One Over the Ait, 8 Kew Bridge Road, Brentford, TW8. For more information visit the ‘Stand Up for Good’ Thames Challenge website page. Laureus Sport for Good supports over 150 sport projects all over the world. From basketball in Belfast to Skateboarding in Cambodia to hockey in Argentina, all the projects use sport to reach the most disadvantaged young people. Waves for Change is supported by Laureus and uses surfing to provide primary social care and emotional support for vulnerable young adults growing up in South Africa’s most violent communities.